Take a tour of the Remodeled offices of Dr. Van Scoyoc in Southern Pines, completed by Huntley Design Build. 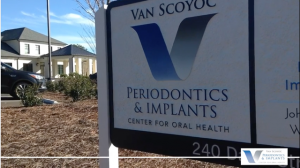 About this video: Dr. Steven Van Scoyoc is a specialist in Periodontics and Implantology. He is board certified as a Diplomate of the American Board of Periodontology. His practice specializes in conservative treatment of gum disease, including specialized interests in soft tissue reconstructive plastic surgery to aesthetically enhance the smile and dental implants that can replace single or multiple missing teeth. He uses the latest technology and science to regenerate bone in the jaws, where bone loss was caused by infection from gum disease, loss of teeth, or injury. This includes sinus bone grafting, where many patients lack sufficient bone thickness in the upper posterior jaw in order to place implants. He also diagnoses and treats oral pathology. Dr. Van Scoyoc’s main interests include soft-tissue and esthetic surgery, as well as implant and advanced bone reconstruction.